For my farewell tour of the US, Paul Reed Smith built me the guitar of my dreams. It is hand made and integrates everything I need in a guitar. It is a magnificent instrument of great intrinsic value, and after my final and farewell tour of America, it will become priceless to me. It is for this reason I wish to auction it at the end of my tour, to raise money for the people who are healing through music, traumatized children and adults, in Palestine. I again visited Palestine in mid October to see the situation, and unfortunately, it has deteriorated. There is acute need for support for this NGO. They are running out of funds, and the wonderful work they are doing will cease without additional support. Children are the future of our world, and those born in Palestine suffer for no reason other than to have been born there. We can help to alleviate this suffering. Speaking as an old hippy, “If I’m not part of the solution, I’m part of the problem”. Thank you for reading, peace and blessings to all, john mclaughlin. We will post the link of the auction on 1st of december. I will donate! I first saw you & the MO in 1971 at Northwestern University and will see you in Chicago on Nov. 17. Thanks for all the music. Mazal tov to you both! I saw your mention of this after the web stream last night. I just donated and probably will again after each performance I see on this tour. Figuring the guitar auction may be out of my financial reach but I still wanted to support this cause. Your passion for music helps fuel my passion for music and I know it can do good in the world. Went to your show in Buffalo, New York. An absolutely brilliant collaboration between you and Jimmy Herring. It was musical paradise. Thank you. I encourage everyone who loves great guitar music to go see it. Also your Paul Reed Smith double neck guitar that you will be auctioning off is an instrument of a lifetime. 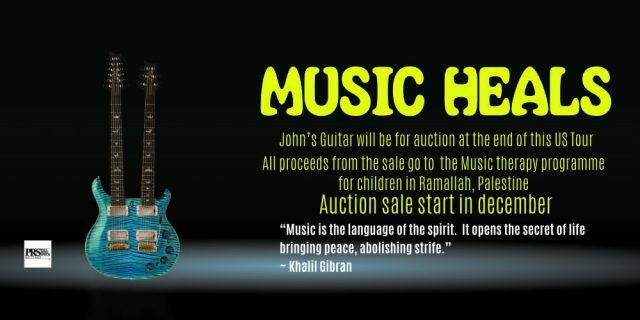 I applaud your efforts to help the families of Palestine by auctioning off this instrument. I know I could never afford to bid on it so I will be happy with the many pictures I took of you playing the instrument from my seat in the balcony. Thank you, John, for your work in promoting awareness of the plight of the Palestinians. I’ve been to a few PCRF fundraisers and can attest to the fact that the Palestinians are wonderful people. NOT the monsters our jewish media makes them out to be. Keep up the fight and I look forward to seeing you in Atlanta. « Jewish media, » gee, that’s not too anti-Semitic. Hey John – how about doing some music therapy in return for the Jewish kids who have Hamas missiles raining down on their heads? I have followed your career since the early 70ies, through every incarnation of your music, and I have almost every album of yours. My admiration for your music and your person grew with every YouTube video of your concerts, when your linguistic talent was also revealed to me. Seeing you in concert on November 10th in Newark NJ was in a way a culmination, a dream come true. Until the end of the concert, when you decided to take a knee in misguided « solidarity » with the overpaid players in the NFL. When I decided to write you about it, I found your « MUSIC HEALS » post. I was again disappointed, by your statement « …. healing through music, traumatized children and adults, in Palestine. » What about traumatized children and adults in Israel, traumatized by almost daily terrorist attacks, be they shootings, stabbings, car rammings, bombings, rockets fired into Israel from the territories, etc, etc.? I considered you to be a spiritual man, and as such, expected you to be impartial. Are Israelis not worthy of your compassion? The United States agreed to provide Israel a record $38 billion in new military aid over the next decade. That 38 billion was agreed upon over two years ago. You accuse me of sarcasm yet you resort to juvenile tactics like using all lower case letters for Palestinian’s. That showcases your superiority complex quite succinctly. We also know where President Trump’s loyalties reside, so that should bring you some comfort. Considering that you are quite superficial in your knowledge of the US-Israel relations, allow me to enlighten you: 90% of the military aid provided goes right back to the US in form of aircraft and other military equipment purchases. That keeps American companies in business. As for upper-case, lower-case, there is no such a people « palestinians ». It is a 1960es invention. Those people are Arabs from the neighboring countries. During the British Mandate in Palestine, the term palestinians referred exclusively to the Jewish population in the Mandate territory. I am quite happy with Trump’s presidency and his policies, inside and outside the USA. Cheer up? I’m pumped! Re Arik’s comment: so, to be compassionate, John should not make this small effort to relieve the suffering of children? That’s some twisted logic you got there, Arik. David Snyder: If you missed my point, I’ll elaborate for you. What I implied is that his compassion should be directed to all traumatized adults and children in the region, and that includes Israelis, who suffer in much larger numbers from palestinian terrorism than palis from Israeli order keeping. Far more Israelis are killed/injured by palis, than palis by Israelis, outside open confrontation. There is one small spot in the world with suffering that John’s taking action to address. You can choose any spot you want, if you care to do the same. Humans hurting humans. Healing is needed everywhere. Your « what about »-ism, to me, is besides the point. My hat is off to anyone bringing more musical joy to the world. Please go hijack another website with your dishonest ranting (hasbara). We are here because we enjoy John’s music. Order keeping? Like the 23 year old PALESTINIAN woman who was snipered to death? If you could bottle your delusion you’d be a rich man. Yet it’s not money that you require. You need help Arik. For now I’m compelled to assume that you’re a frightened, attention seeking, child. A child in need of psychological counselling. Different from many other auctioned benefit-guitars this masterpiece will have a special history of its own because it is part of John’s biography. I wish you strong bidding, the higher the better ! Jewish kids are shell shocked by Hamas missiles raining down on their heads. You might offer them some music therapy, too.